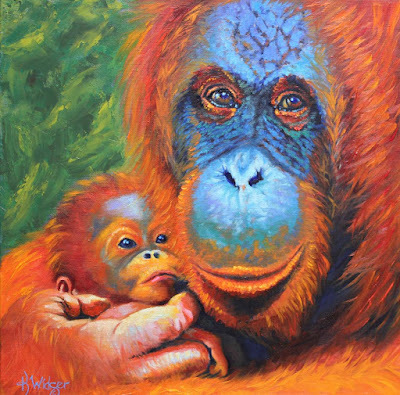 Borneo Mother and Child, copyright 2018 K. Widger, 15" x 15" oil on canvas. One of the most endangered species on the planet, orangutans native habitat in the rain forest of Borneo and Sumatra is being destroyed by international corporations to plant palm oil plantations. The video of an adult male orangutan trying to fight off a huge bull dozer destroying his home is heartbreaking. When their entire habitat is destroyed, they starve to death. Please consider not purchasing products that contain palm oil. For the sake of a cheap ingredient and the enrichment of international corporations, they face extinction.